In a sheet view, select the column (field) to the right of where you want to insert the new column. Select Insert Column option from the Format menu. Specify the field name, title, title alignment, data alignment, and width of the column. 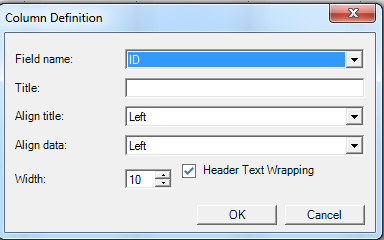 To wrap the column heading text to the next line, select the Header Text Wrapping check box. You can also insert a column in a sheet view, either a task type (i.e. Gantt Chart, Tracking Gantt or Task Sheet) or resource type view (i.e. Resource Sheet), by right-clicking on a column name in the table header and selecting Insert Column option from the displayed contextual menu. The newly added column will be inserted in the sheet to the left of the selected column. Note: To quickly adjust the width of any column in a sheet view or the Gantt Chart to fit the longest item in the column, double-click the right border of the column title. The column width is automatically sized to fit the widest text in any cell. In a sheet view or the Gantt Chart view, select the column you want to remove. Click Hide Column option from the Format menu. Note: When you remove a column (field) from a table, you hide that column. Hiding a column does not remove information from your project file. You can also hide a column in a sheet view, either a task type (i.e. Gantt Chart, Tracking Gantt or Task Sheet) or resource type view (i.e. Resource Sheet), by right-clicking on a column name in the table header and selecting Hide Column option from the displayed contextual menu. The selected column will be removed. In addition to inserting and hiding a column, you can move a column by changing its order in the grid relative to the other columns. In order to achieve this, click on the column name cell from the table header to select the entire column, hold down the column, drag it and release it in front of the column where you want to place it. You will notice that when the entire column is selected, the mouse changes its icon when is hovered over the column name from the table header. The vertical dividing line that appears as bolded (look at the blue arrow in the below printscreen) indicates the position where will be placed the moved column. Note: In case is needed, immediately after you insert, hide or move a column, you can use Undo or Redo options to go one step backward or forward relative to your recent changes.